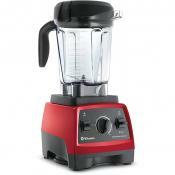 A patented blade design with exclusive cyclonic action ensures the finest consistency of your nutrient-rich smoothie. The blade system easily shreds through stems, seeds, fruit, and vegetables' skin. 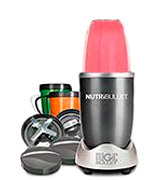 NutriBullet smoothie maker is an outstanding choice for the passionate smoothie admirers. 2 short cups make it a real catch for a couple to enjoy a tasty nutritious drink individually created from your favorite ingredients. 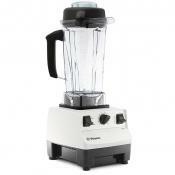 This smoothie maker model is available in gray, orange, and blue colors. Dual direction blade technology allows easy and quick fruit, berries and many other ingredients pulverization. All Metal Drive System ensures unit durability and long service life for you to make up to 10000 smoothies. Plastic lid on a big glass jar may be a bit loose. 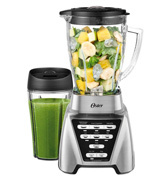 Oster Pro 1200 is a fantastic smoothie maker for a big family, men of activity, athletes and healthy food admirers. 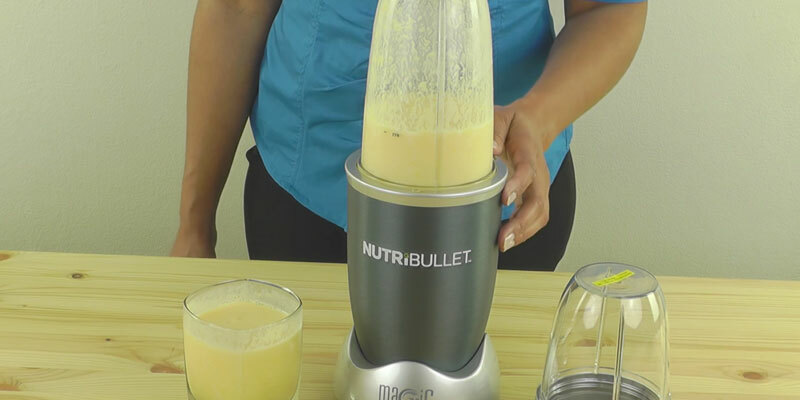 Maximum high power enables you to make a delicious smoothie in seconds. This must-have appliance is available in Silver or Chrome design. Two sets of blades allow not only mincing, chopping, blending and pureeing ordinary ingredients but also crushing ice and any frozen fruit, berries and vegetables. Two bowls are perfect for preparing, microwave heating, storing and serving your food. And owing to a flip spout on the pitcher you can pour a portion of fabulous smoothie to anyone! Comparatively low power. But it has no impact on unit's efficiency. A fairly simple and reliable kitchen appliance. 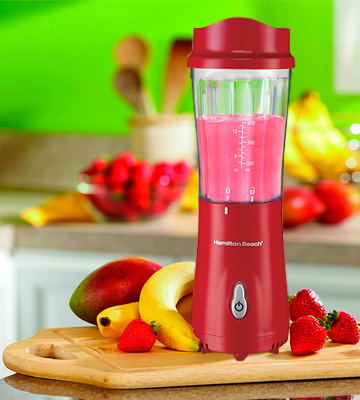 An amazing smoothie maker for a big family at an affordable price. Fitted with a chopper bowl and a pitcher this multifunctional food processor will make delicious appetizers, dressings, dips and nice ice cold drinks even for a small party or gatherings with friends. The whole unit is very compact, the bowl comfortably fits into the palm and comes fitted with a travel lid that makes it convenient for the use on the go. A narrow jar is somewhat difficult to clean. Simple, energy-efficient, and a breeze to use, the Hamiton Beach 51101R is a great appliance for everyday home use. 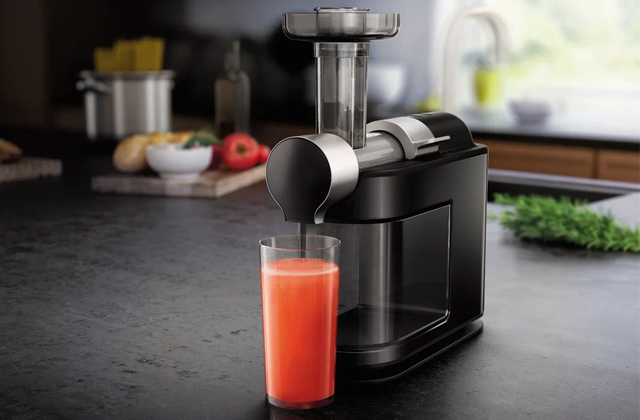 At a single touch of a button, it will allow you to make healthy thick drinks for your family, puree baby food or make a salad seasoning and a sauce. The brand-specific FusionBlade™ boasts a well-thought design to crush and blend solid ingredients including ice maximum quickly and achieve ideally homogeneous results. The motor might produce burnt smell during a long operation. 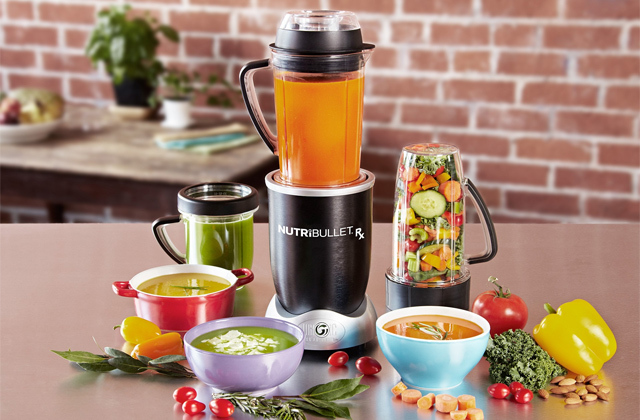 Paired with two detachable jars, this practical Black and Decker blender will be a great choice for a couple on a healthy diet who prefers to take their boost of energy with them, whether they drive to work, go to the gym, or just walk in the park. At an affordable price, you'll get a really functional appliance. Nutribullet smoothie maker is a tremendous powerful 600-watt appliance designed to make healthy and nutritious smoothies with a silky texture. It comes with a 32-oz tall cup and two 18-oz small cups allowing you to make from 4 to 6 cups of your favorite thick beverage at a time. 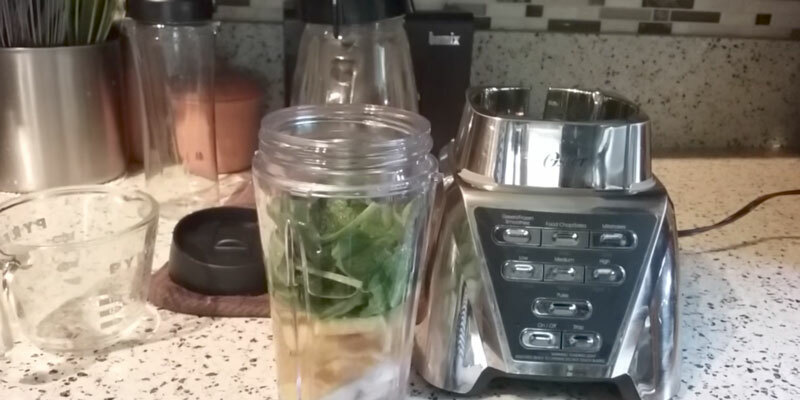 The smaller cup is especially convenient if you want to chop greens, nuts, and some other additional ingredients for your smoothie or make the baby food for your little one. But in case you often make liquid mixtures you'd better take a big cup. 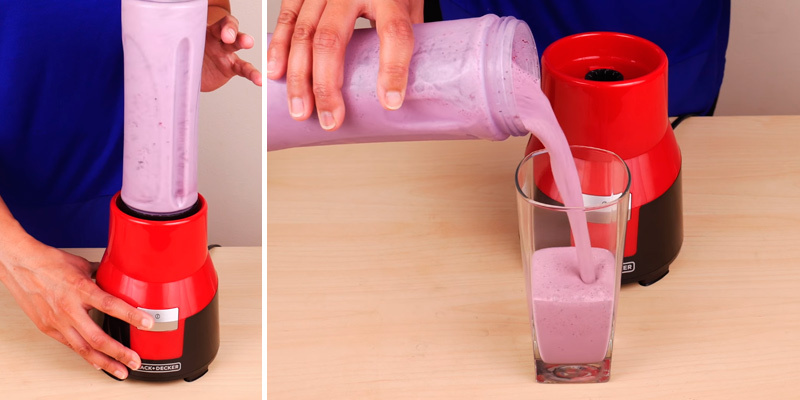 At the same time, 2 separate small cups make this smoothie maker an exceptional solution for couples and families with kids. In the morning, every member of your family will have a chance to create a unique smoothie for breakfast. 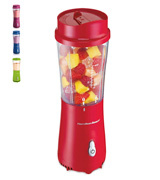 Only one Pulse button of this incredible smoothie maker enables you to apply 3 different modes - Pulse, Shake, and Tap. 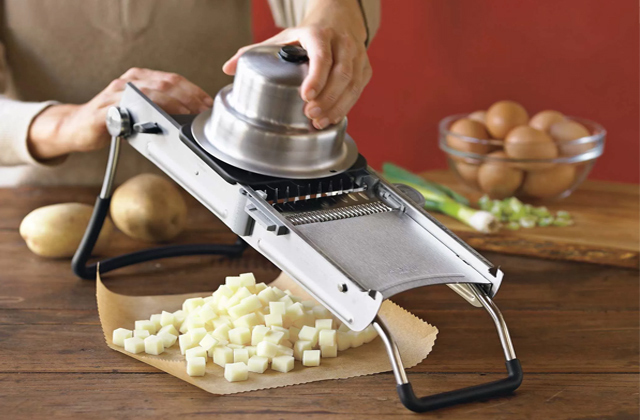 The Pulse mode will help you cut the food in seconds without pureeing it. This is exactly what you need to get a perfect salsa or coarsely chop the onion. Shake mode is useful when you put too many ingredients into the cup and add insufficient water. And the Tap mode allows efficient ingredients pulverizing to make a thick smoothie with a small amount of water. This fairly simple and at the same time high-performance smoothie maker will become an amazing acquisition for any user to vary an everyday menu with healthy, nutritious and fresh beverages made from natural ingredients. Blender cups are made from absolutely safe food grade BPA-free plastic without toxins emission when contacting food, including hot food and acid ingredients. Metal blades with exclusive Bullet cyclonic action will pulverize and puree any fruit and vegetables, blend a cocktail or milkshake and crush the ice to fine chips. 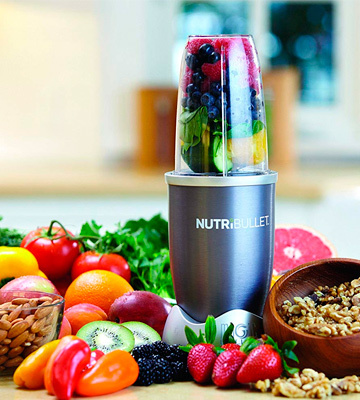 But what truly sets NutriBullet apart from the rest is its unmatched extraction abilities. A specialized extractor blade will convert whole vegetables, fruit, seeds, nuts and other superfoods into a perfect emulsion. It will break down the ingredients to the most absorbable form releasing important vitamins and minerals contained within. Meanwhile, the milling blade will easily turn oats, seeds, and nuts into powder. For your ultimate convenience, this smoothie maker comes with two stay-fresh lids enabling you to sip your favorable smoothie right from the cup. And two other lids are good for storing your drink or sauce in the fridge. Owing to its dishwasher safe cups and easy-to-clean blades this magnificent smoothie maker will save your time on cleaning. 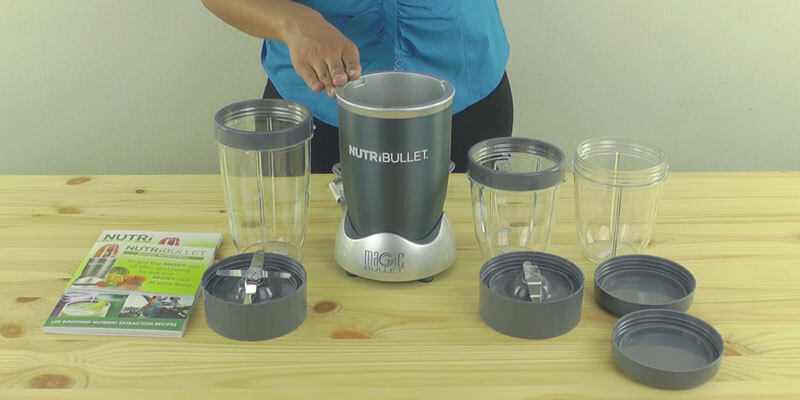 NutriBullet is simple and functional. It is your path to improved vitality and a healthy life! I like that it comes with two different size cups/containers. As well as two different type blades. I have only used the 4 blade at this point because the 2 blade is for making powders (Which is what the book says?). Although the larger size of the tall cup makes this blender more versatile, it's still somewhat optimized for making smoothies. 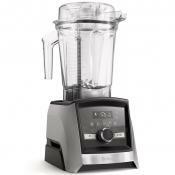 As such, you'll probably want to hold onto your standard all-purpose blender for certain tasks. After years of owning the original magic bullet, I decided to upgrade to this. Big upgrade! Large cup. Very powerful. And it really breaks down fruits and veggies. 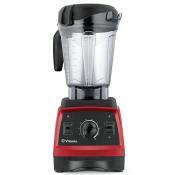 I use it mostly for smoothies and mixing up drinks instead of lugging out the big blender. I do like the extra capacity of the large cup, and the different lids. Oster Pro 1200 comes with two separate reservoirs in the package. A big 48-oz jar (about 6 cups) of this high-quality machine allows you to make large batches of great-tasting smoothies, milkshakes, and sauces for a big family or a party with your fellows and friends. While thanks to a 24-oz smooth cup you can prepare single serve drinks if you need only a small batch. An extremely powerful 1200-watt motor will impress any user. 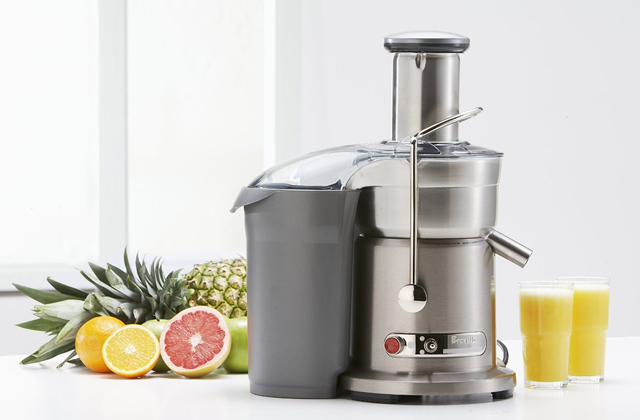 In seconds, it will crush ice and blend greens, nuts, frozen and fresh fruit, berries , and vegetables. High-power characteristics are especially important for individuals who live an active life and estimate every minute. This cutting edge high-performance unit will become a real catch both for a common user and a culinary expert. 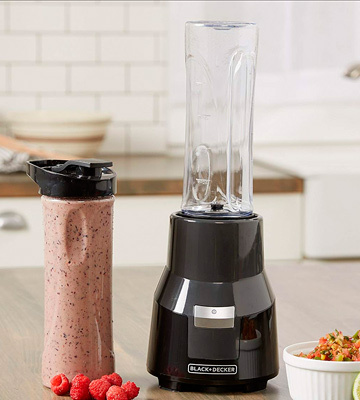 For your comfort, this incredible smoothie maker features smart settings. 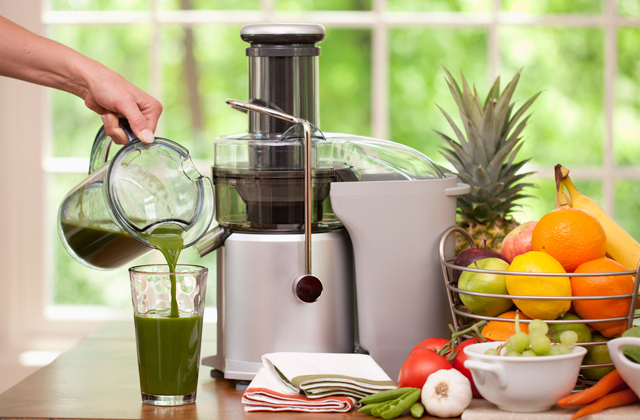 If you do not know the exact blending time for your combination of ingredients simply select one of the 3 preset programs to make a delicious smoothie, favorable sauce or a tasty soup. A blue light indicator will let you know when the process is over. 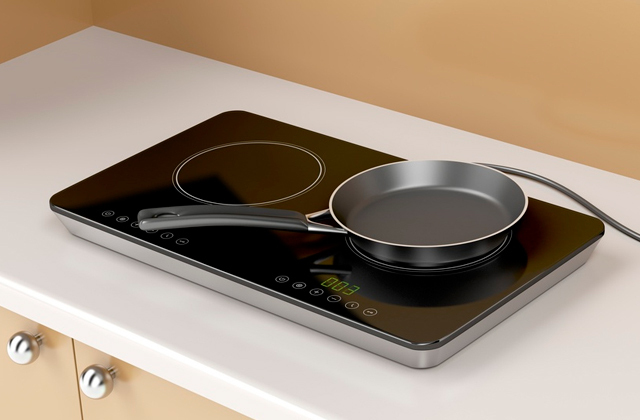 Besides, one-touch High/Medium/Low control buttons allow you to vary the blending speed and explore your culinary abilities creating some new flavors and concoctions. Thanks to a special wide blending jar, all the ingredients will reach the blades for efficient blending and ideal smooth consistency without unground chunks. 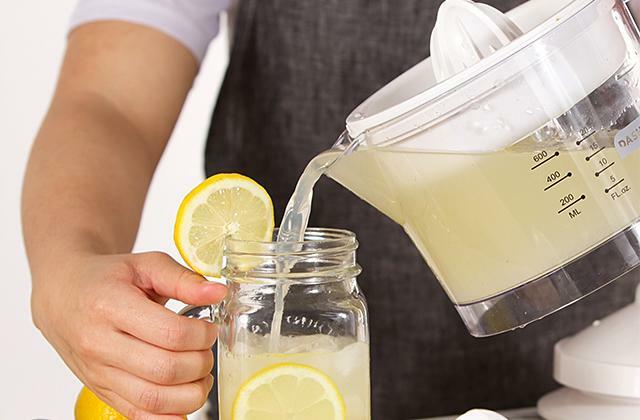 A 6-cup dishwasher safe pitcher is made of durable Boroclass glass. 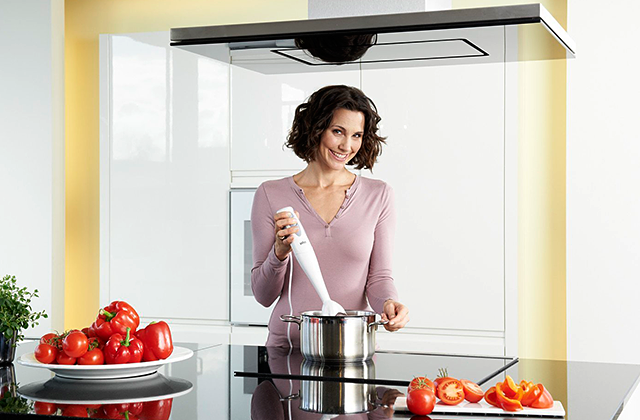 It withstands thermal shock giving you an opportunity to mix even hot ingredients for your favorite cream soup or puree. Besides, the glass is odor-resistant and your vanilla milkshake will never have a taste of morning spinach smoothie. A personal size smoothie cup with an airtight travel lid is made of BPA-free plastic. Hence, you can easily take it with you on your way to work or to the gym. In case of falling down, it won't break. A jar lid features replaceable 2-oz filter cap enabling you to add some ingredients during machine operation. The cap can be also used as a measuring cup. Owing to its highly durable stainless steel blades and all-metal drive system this hi-tech smoothie maker will serve you for years! And finally, depending on your preferences or your kitchen interior you can choose Silver or Chrome design for your best-ever Oster Pro smoothie maker. Cleanup was not as bad as it has been with other products in the past. Having dishwasher safe components makes cleaning up much easier. The product seems to be of good quality. 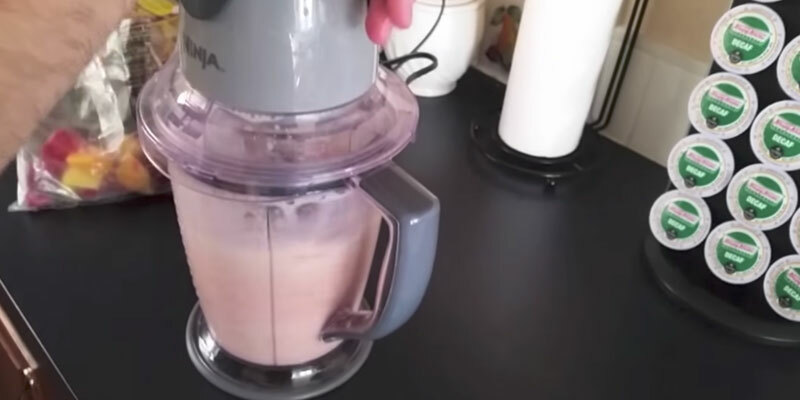 It is far superior to my previous OSTER Blender in terms of sturdiness, capacity and dishwasher ready.Haven't used the Smoothie cup because we don't do smoothies but I can imagine that people with kids would love it. First the thing is great! I love the back and forth motion of the motor. The unit is very noisy, but its definitely a powerful motor. Perhaps a bit too powerful - as the main spine that sticks up worked loose, sadly the threads were the only thing holding in in place (it wasnt also pinned). The style is clean and easy to maintain, no cracks and crannies that can't be cleaned after any spills. Ninja QB900B comes with 2 separate bowls - a big 48-oz pitcher (about 6 cups)and a small 16-oz container (about 2 cups). A small container is good for your favorite cream soup, bisque or chowder. It will easily chop, mince or dice any ingredients for your individual salsa recipe and make unmatched delicious appetizers and snacks for your party. 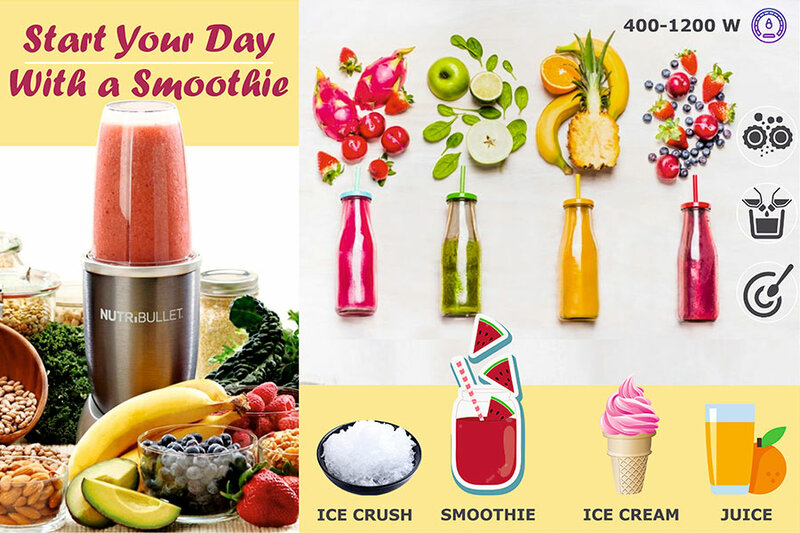 At the same time, a large pitcher will be just perfect for making healthy nutritious smoothies for the whole family, nice milkshakes for your kids and refreshing ice cold drinks for your guests. A 400-watt motor is enough for efficient operation. But if you seek for a high-performance unit you may purchase this model with a 450-watt motor, buy an Express Chop kit or even take the maximum package - a 450-watt chopper and blender with two cups of different capacity. This model features pretty simple controls. 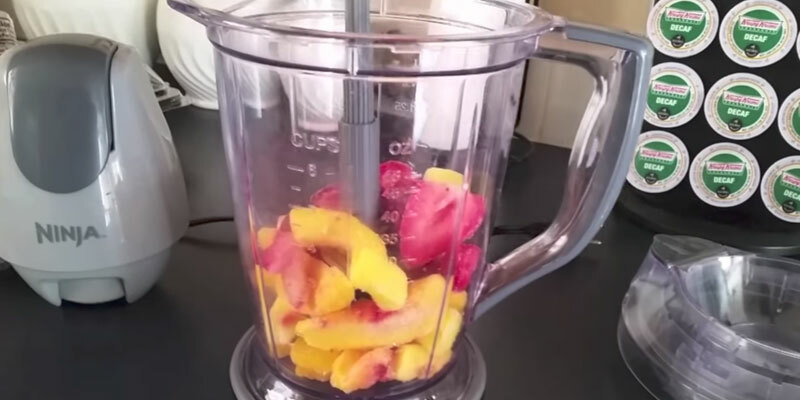 Being easy-to-use, this smoothie machine is highly functional. 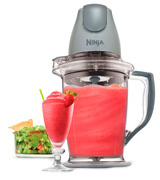 Your Ninja smoothie maker has only one pulsing control button, but it is more than enough to get consistent results. 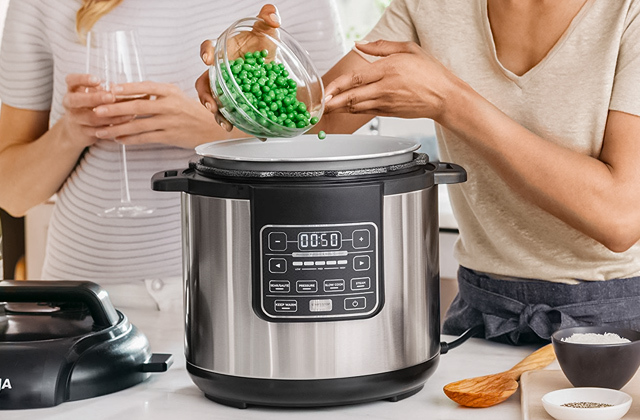 Just change a power pod between the chopper bowl and the pitcher to crush the ice into snow, blend frozen fruit and berries into creamy chilling drinks and desserts, chop, mince, dice or puree your favorite ingredients to tasty salads, salsas or dips. 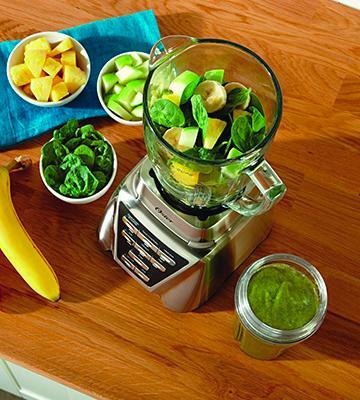 This high-end smoothie maker will add versatility to your kitchen, giving you an opportunity to feel like a real chef. 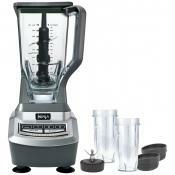 Except for the metal blade attachments, all the other parts of this smoothie maker are made of firm BPA-free plastic. Ninja QB900B unit is very convenient and easy to clean. Its replaceable plastic parts are highly durable and will serve you for years. Anti-spill splashguard, easy flip spout, and no slip base contribute to usability and functionality of your Ninja smoothie maker. For additional comfort, the unit comes with two storage lids to keep your drinks, sauces or appetizers fresh for a long time. Whether you are a health-conscious individual or simply want to prepare some dainties for your family or guests, this food and drink maker will cope with any task! It's compact, has a 6 cup capacity, which is way more than I need for morning smoothies, and it's quieter than an average blender. I'm really glad I got this because I like how the motor is so compact and not bulky like a traditional blender. I bought this blender a few months ago, and have used it quite a few times since. This product is mostly made out of plastic, which makes it very lightweight. 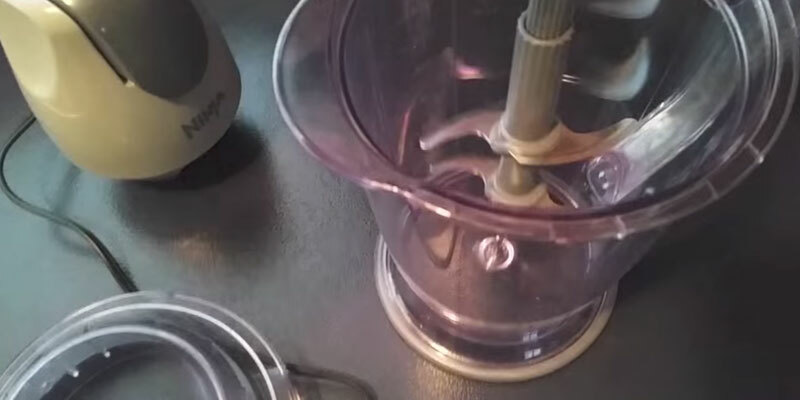 Also, the blades (very sharp by the way) are on a removable spindle so cleaning is very easy...which is important for a blender! Wow, it is super powerful, too! I never get discounts or freebies for my reviews, so this is 100% factual without any bias. The choice of modern kitchen appliances is almost endless and offers a whole variety of options to make our daily menus complete and diverse even when we drastically lack time for cooking. Smoothie is one of those quick and easy-to-make meals that will add to any diet, whether you are a slimmer, an athlete or simply try to make your nutrition more balanced. 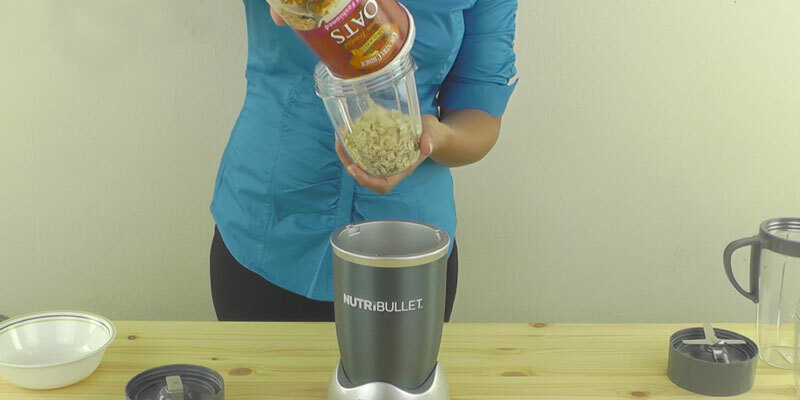 However, a stationary countertop blender or a bulky multifunctional food processor is not always an option when it comes to mixing a single-serve drink. This is where a compact smoothie maker from Hamilton Beach will be highly appreciated. What you’ll get here is a little countertop appliance powerful enough to turn your choice of ingredients to silky smoothies or homogeneous purees. The whole construction and the unit operation are fairly simple. A 14-oz jar rests on a motorized base with a single push button. You just need to fill the bowl with ingredients under the recipe and keep holding the button until the bowl content is liquefied. It won’t take you more than a couple of minutes to make a wholesome and nutritious meal or a midday snack. Though a 175-watt motor is not the most powerful out there, paired with a strong 4-prong blade, it allows turning to puree anything from juicy fruit to fibrous veggies to solid roots to leafy greens and seeds. At a single touch of a button, you can make a thick energy drink for yourself, quickly toss all-natural fruit puree for your little one or make a delicious sauce or salad dressing. 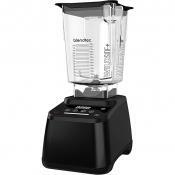 And for the great job this blender does, its cost is close to ridiculous. 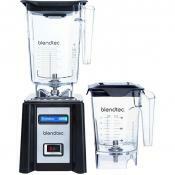 The only recommendation for achieving the best blending results and prolonging the appliance service life is to put solid ingredients first and use a pulsing technique when mixing. Offering convenience of stationary blending, the Hamilton Beach is an extremely portable model you can take with you wherever you go. 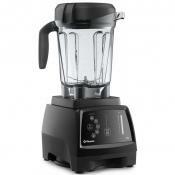 With handy cord storage at the bottom and truly compact size, this blender takes minimum storage space. Hence, it will easily find its place in your RV kitchen and perfectly fit into a travel bag or backpack. It means that you don’t have to step out from your eating habits or healthy diet when on holidays or during your travels and journeys. The Hamilton Beach will always be there to help. On top of that, a mixing jar doubles as a portable travel mug. 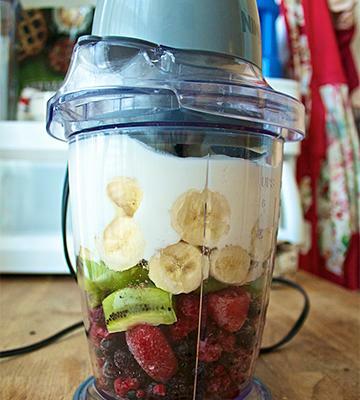 Once your smoothie or shake is blended, cover the jar with a drinking lid and you are ready to go. 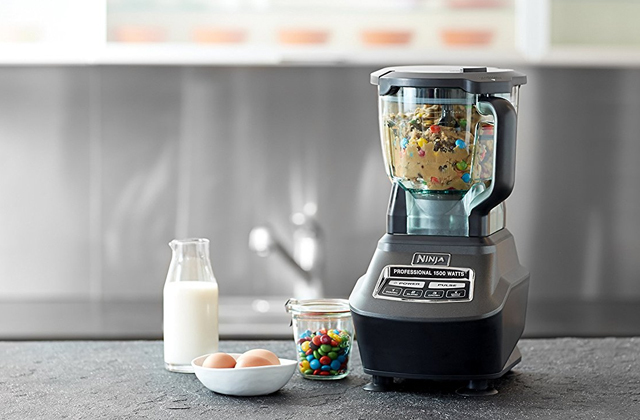 To resume, this little smoothie maker from Hamilton Beach will make a functional addition to any kitchen arsenal and will be especially of great use for small kitchens concise in storage space, for dormitory dwellers as well as for personal use and for the use on the go. How often do you skip breakfast simply because you lack time in the morning rush and then eat whatever turns up to make it out to lunch? A nutritious vitamin-packed smoothie is by far the best start of the day for your body and mind and blending it won’t take much of your time in the morning. Stop skimping on your health and turn your eyes to the Black and Decker smoothie maker to make nutritious breakfasts for yourself and your loved ones. 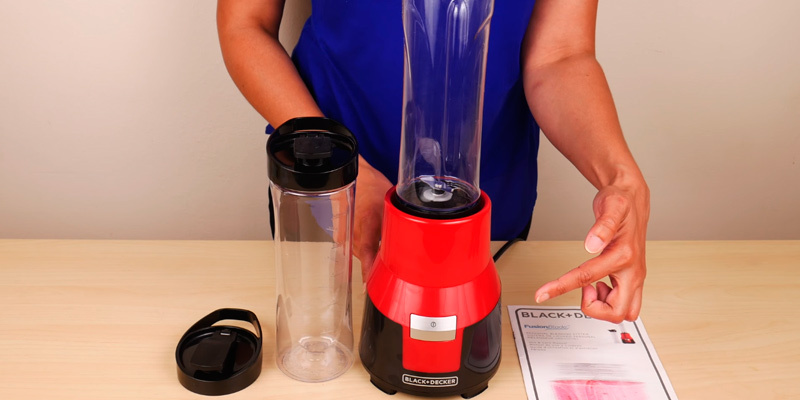 While more sophisticated blenders and mixers might require some sort of twist of the wrist and will take you some time to puzzle out all controls, the Black and Decker offers no-frills On/Off functionality, yet, still delivers perfect blending results. You can control the whole process and the consistency of your drink by simply pushing a single button. Unlike larger premium models fitted with high-capacity pitchers or jars that make you end up blending too much, this unit comes with two smaller 20-oz bottles. This volume is just right for a substantial single portion and you can blend a second bottle for your partner straight away. This way, you won’t waste ingredients and always have a freshly mixed drink, smoothie or protein shake packed with essential nutrients and vitamins in their easy to digest and absorb form. What’s more, both jars are complete with twist-on no-spill travel lids allowing you to take your healthy beverage on-the-go which is good news for sleepy heads who are always in a hurry and athletes who need their energy boost after a workout. One more benefit of this model we can’t leave behind is the ease of cleaning. Made of durable BPA-free plastic, the jars and lids are dishwasher safe, so, washing them is no hassle at all that often appears a pain in the neck with other models. For a space-wise design the Black and Decker is encased in, this compact appliance will impress you with a pretty powerful performance. The motor power of 275 watts is not the highest rate available, yet, it is high enough for the model of this size. 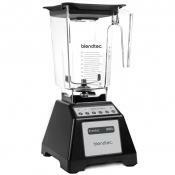 Besides, in a combination with a brand-specific blade, it will deliver amazing blending performance. The FusionBlade™ is made of first-grade stainless steel and boasts a well-thought design to consistently crush and blend both soft and solid ingredients. 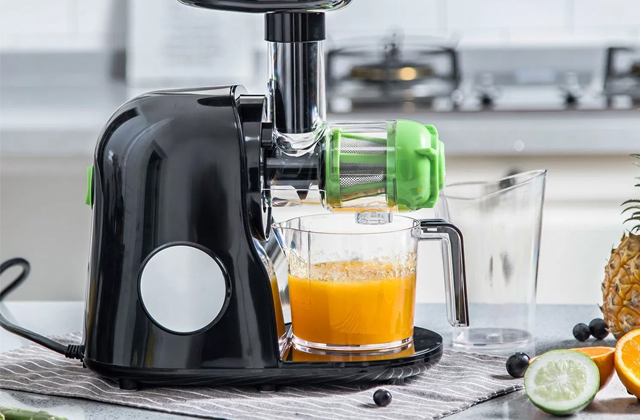 Whether you need to make a creamy milkshake, a zesty dressing, a yummy cream soup, or a mixed drink, the Black and Decker will perfectly cope with all those tasks. It can even crush through ice and grind nuts as well as achieve a homogeneous consistency with literally any set of ingredients. The blades won’t lag or get clogged and all your treats will come out smooth and flavorful. To round things up, the Black and Decker is a practical, functional, and affordable choice for any household. Whether you want to grow healthy eating habits or simply seek to diversify your daily menu with delicious meals, this compact smoothie maker will fit the bill. Today, when our life is extremely dynamic, healthy eating is becoming more and more important. To maintain your vital energy you need to get an appropriate amount of minerals and vitamins in a very short time, and in this case, a smoothie will become a quick, healthy and easy solution. It is a thick smooth beverage made from blended raw fruit, berries, vegetables, and other ingredients such as ice, dairy products, juice, spices, syrup or honey. Being a wholesome, great-tasting and easy-to-make dish, the smoothie is mainly a choice for active people and for those keeping their figure or trying to lose weight. At the same time, it is an excellent chance for everybody to tap into a healthier lifestyle. Hence, a Smoothie Maker will help you prepare this delicious, energetic beverage in minutes. 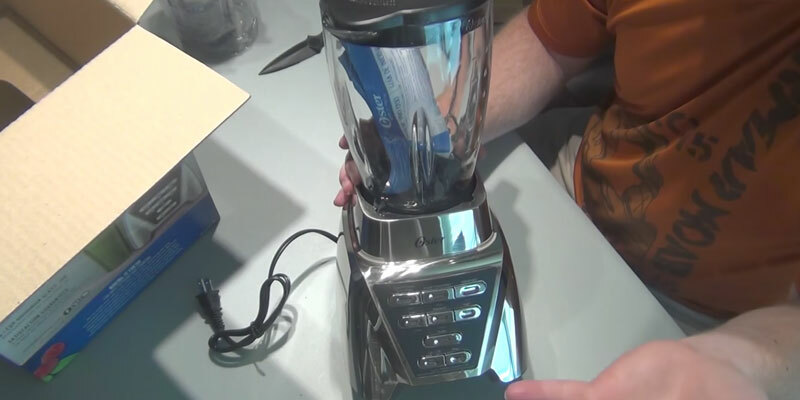 Actually, it looks like an ordinary blender with some extra features. Our best smoothie maker's review will give you an insight of the essential blender or Smoothie Maker features to blend your perfect smoothie. At the same time, if you are a fitness lover, and want to make your everyday menu well balanced, or simply need a tasty breakfast for your kids we strongly recommend you to check out yogurt makers. It will become another valuable contribution to the health and well-being of your whole family. Performance is the first feature you need to consider if you want a really good smoothie with fine consistency. 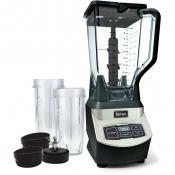 Performance directly depends on theSmoothie Maker's power and capacity of the jar or cups it comes with. 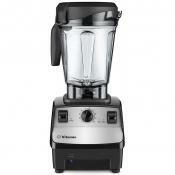 To get a well-blended smooth beverage select models with power over 400 Watts. 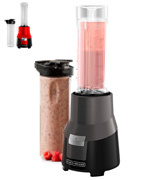 The best smoothie maker will not only carefully grind different density ingredients, but also crush the ice and mash the frozen fruit and berries to liquid condition. If your whole family members decided to stick to a healthy lifestyle, you should choose high-capacity units with 36-48-oz bowls. Meanwhile, a small on-the-go smoothie cup will be a nice extra advantage for an individual smoothie to drink on your way to work. This criterion also includes the best cooking options for smoothie machine. 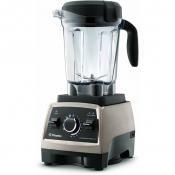 Predominantly, smoothie makers do not require a number of settings or speed options. 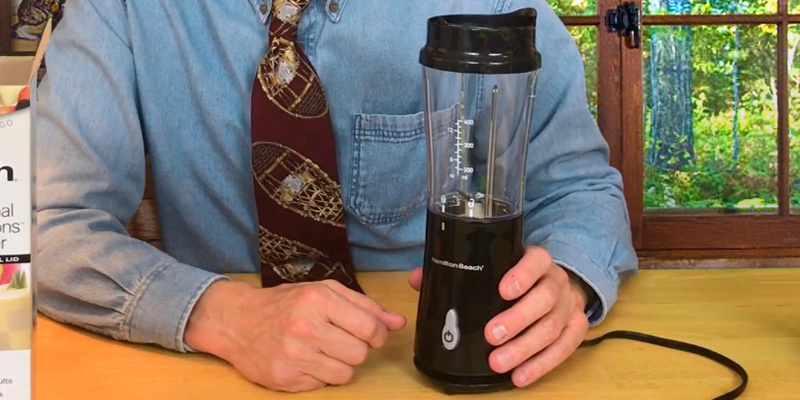 In most cases one high-power mode is enough to grind, liquefy and homogenize all ingredients including ice. 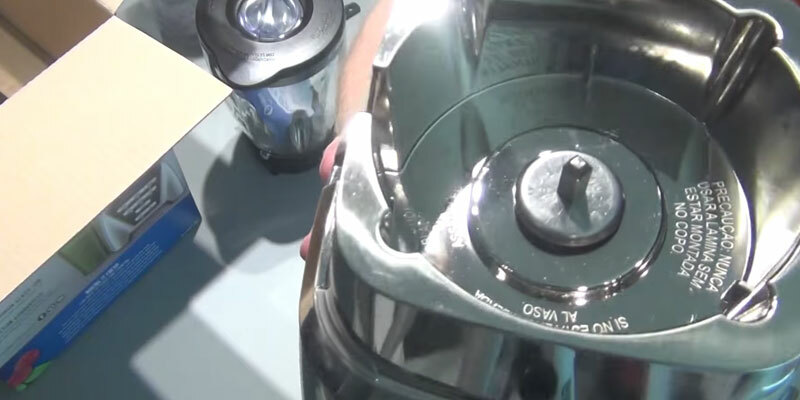 Hence, many models of blenders feature only one Pulse button to activate a special mode to get the necessary beverage thickness and consistency. 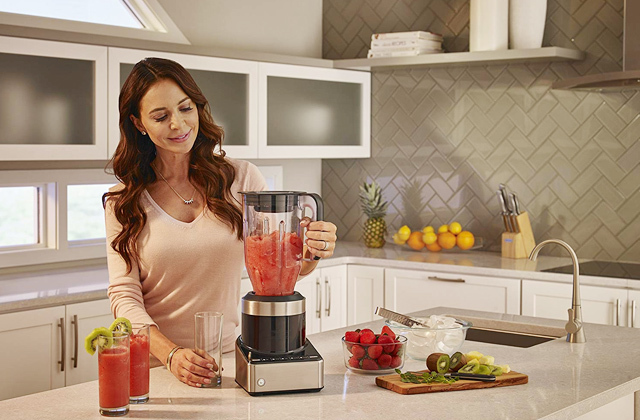 At the same time, some manufacturers have expanded the functional characteristics (features) of smoothie makers, providing several speed modes or even preprogrammed settings for your ultimate convenience. The last but not the least is your smoothie maker design. It includes grinding attachments, blender body, and bowl or cup materials and extra accessories to ease the use of this appliance for maximum convenience. It is noteworthy that blending attachments are highly efficient. They grind fruit, berries and vegetables to an almost liquid condition, as well as, crush ice and puree nuts for smooth and appetizing sauces, smoothies, dressings, and dips. Some manufacturers experiment with the blade positions, width and design to get the best-ever result. The next important aspect is the material a blender jar or bowl is made of. Glass pitchers are durable, scratch-resistant, and dishwasher safe; that makes them a reliable solution for any kitchen. Nevertheless, many users prefer plastic jars thanks to their break-resistance and high-quality BPA-free plastic. This material is especially suitable and convenient for on-the-go cups. Extra accessories most often include different replaceable lids to cover the bowl for storing your smoothie in the fridge. The lids for smaller personal cups are mainly intended to prevent spills and leakage. Some lids even feature a 1 or 2-oz cap to be used as a measuring cup or to add some additional ingredients without interrupting operation of a smoothie maker. There are also smoothie makers that have a special spout to pour your beverage without taking off the pitcher. Finally, few elaborate models have a built-in stir stick to scrape the pitcher's sides for better ingredient mixing when the machine is on. 3. 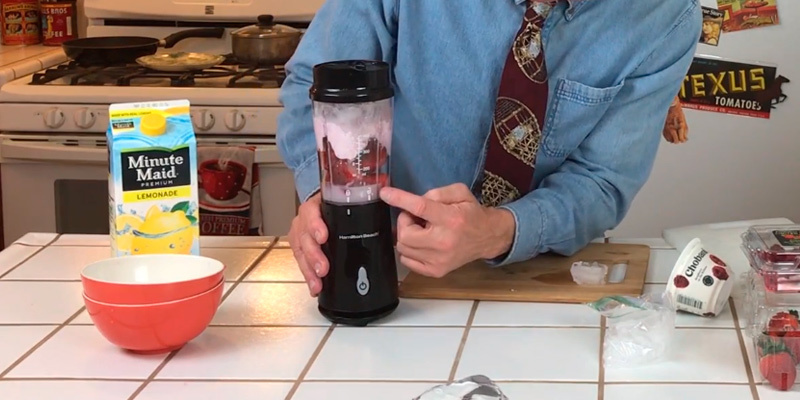 Difference Between a Blender and a Smoothie Maker, DoItYourself. 6. Facts on the Health Benefits of Smoothies, LIVESTRONG. June 19, 2015.